Associated Press Notre Dame's Arike Ogunbowale drives on Florida State's Nausia Woolfolk on Sunday. Ogunbowale scored 27 points to lead the Irish. SOUTH BEND – Muffet McGraw got the effort she wanted from No. 4 Notre Dame right from the start Sunday, especially from Arike Ogunbowale, in a 97-70 rout of No. 24 Florida State. “She looked like she was enjoying herself out there,” McGraw said after Ogunbowale, who has been struggling of late, scored 27 points. Jessica Shepard added 26 as the Irish, who had two rare Atlantic Coast Conference losses in their last four games, rebounded from Thursday's 72-65 defeat at No. 25 Miami. 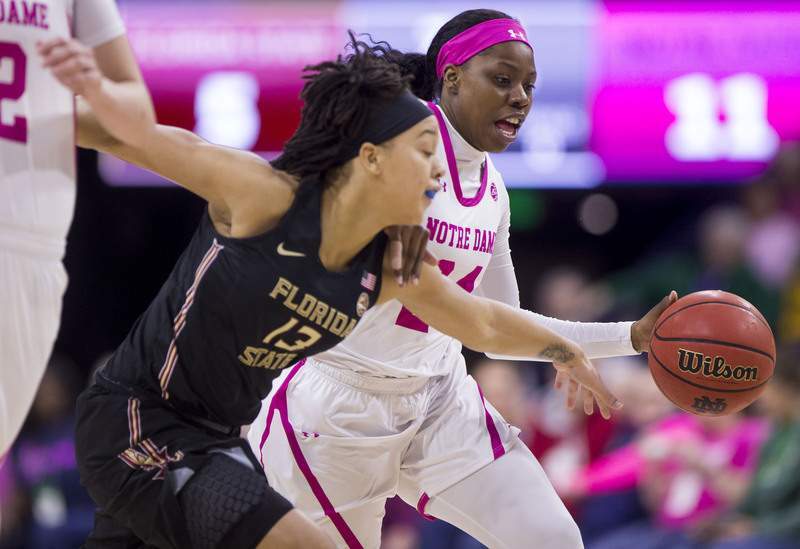 “I've got to be aggressive from the start – I've been kind of laid back,” said Ogunbowale, who had 13 points on 4-of-15 shooting against the Hurricanes but hit her first four shots against the Seminoles. Nicki Ekhomu scored 26 points, Kiah Gillespie added 17 and Nausia Woolfolk had 15 as the Seminoles (20-4, 8-3) lost for the first time on the road this season.